A good credit score is about 690 or higher on the 300-850 scale commonly used by FICO and VantageScore. A good credit score generally starts around 690 on a 300-850 scale used by FICO and VantageScore, the two most common scoring systems. 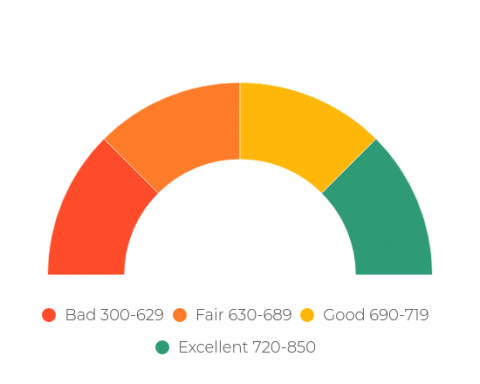 In practice, though, a good credit score is in the eye of the beholder: Lenders, such as credit card issuers and mortgage providers, may set their own standards on what “good credit score” means as they decide whether to extend credit to you and at what interest rate. FICO, the most widely known credit scoring system, and its competitor VantageScore both use a 300-850 range. The majority of credit scores are 650 or above. The average FICO score hit a record 704 in 2018, according to FICO (for the FICO 8, the version most commonly used in credit decisions). The average VantageScore in 2018 was 680, a VantageScore spokesman said. Having good credit matters because it determines whether you can borrow money and how much you’ll pay in interest to do so. An unsecured credit card with a decent interest rate, or even a balance-transfer card. A desirable car loan or lease. In many states, people with higher credit scores pay less for car insurance. A good credit score helps in other ways: In many states, people with higher credit scores pay less for car insurance. In addition, some landlords use credit scores to screen tenants. Employers may also look at your credit standing (looking at credit reports, though, rather than scores) as part of the hiring process. So having a good credit score is helpful whether you have plans to apply for credit or not. Pay bills on time, every time. This is important because payment history has the largest impact of all the factors in your score. Use credit lightly. Keep your credit card balances well below your credit limits. Don’t go higher than 30%, and lower is better. This factor, called credit utilization, has the second-biggest influence on your score. Keep credit accounts open unless there is a compelling reason, such as high fees or poor service, to close them. Keeping older accounts open helps your average age of accounts, which is a secondary influence on your score. Also, closing an account cuts into your overall credit limit, driving up your credit utilization. Avoid making several credit applications in a short time frame. Credit checks for the purpose of credit decisions can cause a small, temporary dip in your score, and several in a short time can add up. Monitor your credit reports and dispute information you believe is incorrect or too old to be included (most negative information falls off after seven years).